We spent the weekend working in the yard and cleaning out flower beds. It looks beautiful and of course, Bentley and Pierre were lots of help. Monday was another glorious spring day with temperatures in the low 80’s so we decided to spend some quality time playing. I have mentioned before how much Pierre loves this Unbreakoball. Skipper kicks or throws the big orange ball and Pierre races after it. He will chase it all over the yard barking and biting at it. This ball has stood the test of time and still looks brand new. Bentley doesn’t like to chase balls but he loves playing hide and go seek with me. 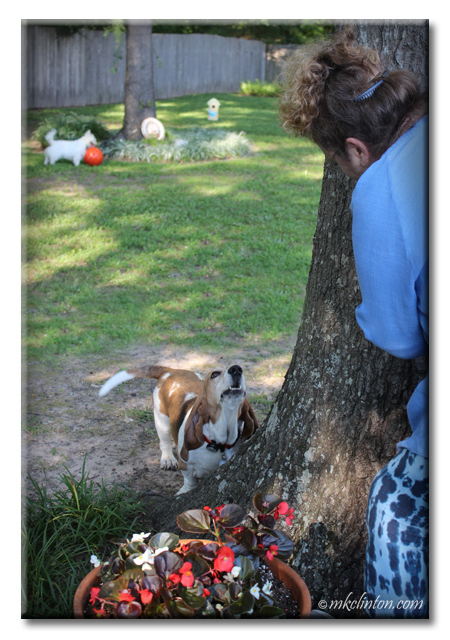 He runs to find me and barks to let me know that I can’t fool his Basset Hound nose. Skipper and I had as much fun as the boys. We are thankful the forecast is for beautiful weather again today. Perhaps an extra-long walk is in order! 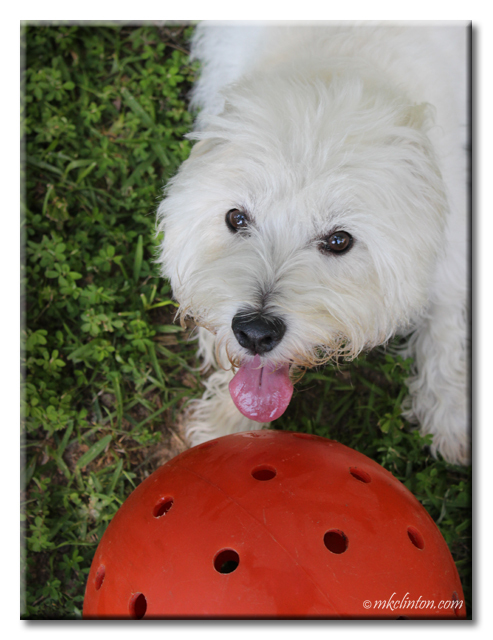 You can fetch your dog a 6” or 10” Unbreakoball on Amazon. We have the 10” and it is big for Pierre but he loves it. Hide and seek is a fun game. Plus tricky. Sometimes when I find Mom she gives me a Cheerio! I like a game that involves treats! We can't help smiling watching you play hide-n-seek with Bentley☺ Have fun with your ball, Pierre! Oh I LUFFS playtime, can I come over and join in please? Just hanging out doing fun stuff and snuggling with Mom is our favorite thing too. We hope things quiet down a bit the end of the week and we will have more time together again. The last six weeks or so have been way too busy! Looks like the perfect way to spend some time outside! It rained here all weekend, hopefully the next one will be nicer! Oh, outdoor playtime with each other is the best, isn't it! So glad you had a terrierific weekend! Wow! What a great day! I had a good day yesterday too. I saw a bunny in the neighbor's yard, and I almost caught a birdie. What a fun couple of days!! Bentley doesn't love playing ball? Dog oh dog is he ever missing out! He is strictly a laser light fellow! BOL! Those are two lucky boys to have such fun peeps!! Should Pierre tire of being a beloved pooch living a life of love he could possible be a shoe in to replace that Beckham guy. Omg... the hide-and-seek pic is adorable!! Outdoors on a warm day WITH the dogs. Bliss. LOVE the hide and seek photo. It looks like everybuddy had a lot of fun! We have some nice weather too. you guys look like your having fun. Luke loses interest in playing ball (unlike Cricket) so maybe I should try some hide and seek with him!